The research I was reading was about relationships: all part of my self-education into why people sometimes believe that which is blatantly untrue (often to the detriment of animals and in the face of overwhelming evidence to the contrary). For example, there are two uninhabited islands in southern Lake Erie where cormorants and other colonial water birds (herons, gulls) nest. On one of them, the cormorants are regularly shot off their nests, and on the other, they are left alone. The concern is, in part, that the cormorants will drive away other bird species. 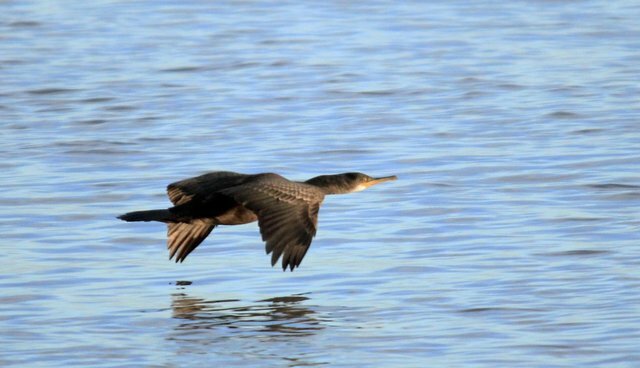 But, surveys of the other island, where cormorants are left, show that the other birds not only remain with the cormorants, but some reach higher numbers when the numbers of cormorants are also high. Therefore, there seems no reason to shoot the cormorants. Even though cormorant excrement can kill off vegetation, there is still plenty on the island that is left alone. That's just one example. There are a great many more, and experts call this inability to make a logical deduction based on observable, measureable, demonstrable facts "cognitive dissonance" or, more familiarly, "willful blindness." I'm also interested in why some people seem to look for reasons to kill animals (and, all too often, each other)! I understand that animals can be a nuisance, as can people, but why can we tolerate some nuisances and not others? My research is peripheral to my regular animal protection work, but important in understanding what we are up against. Within the overreaching reality that we are a very diverse species with various people having all kinds of values, interests, experiences, intelligence, emotions, principles, ethics, backgrounds, needs, and so on, it seems that an overriding fact remains: in every successful relationship, the people involved worked at making it succeed. Those who have had successful marriages, business partnerships, teaching and learning experiences, family compatibility, meetings, get-togethers, neighborhood relationships, employee/employer relations, and so on all seem to agree that you have to work at making the relationships succeed. With animals who often annoy people, we are, like it or not, in a relationship. It is somewhat one-sided; we are the ones who can adjust. The squirrels, raccoons, starlings, sparrows, pigeons, mice, bats, and skunks who are in our midst and share our world are not aware that their presence and activity can either please us or annoy us, or that the same activity can be irritating to one person while pleasing another. I once heard of a man who shot mockingbirds because their songs awoke him: an unthinkable attitude for me. I have had people call to ask me how to get rid of something-like frogs calling from a pond in the yard or swallows nesting in a car port-that would give me pleasure. All of this came to mind when, recently, a casual acquaintance, overhearing me talk with pride about wildlife in my garden, asked why he was so bothered by them and I wasn't. Simple. We have a relationship, the animals and me. Their part is just to be themselves. My part is to work at making sure I enjoy them, without them harming my interests. I do have to work at it and take steps to avoid squirrels in the roof or raccoons in the garbage. But, I'm human; I'm supposed to be able to make intelligent decisions. That is what the scientific name of my species means; Homo sapiens means wise man. Wise enough, I am, to take pleasure in the animals who share my world.